High drama meets local color as a private investigator works to uncover the motive and identity of a killer in this Shamus Award–winning first Cecil Young investigation set in Sitka, Alaska. Cecil Younger, local Alaskan investigator, is neither good at his job nor at staying sober. When an old Tlingit woman hires him to discover why her son, a big game guide, was murdered, he takes the case without much conviction that he’ll discover anything the police missed. He really just needs the extra cash. But after someone tries to kill him, Younger finds himself traveling across Alaska to ferret out the truth in the midst of conspiracies, politics, and Tlingit mythology. High drama meets local color as Cecil Younger works to uncover the motive and identity of the killer. John Straley was born in Redwood City, California, in 1953. He received a BA in English from the University of Washington. When his wife, Jan, a prominent whale biologist, announced she was taking a job in Sitka, the two headed north and never left. John worked for thirty years as a criminal defense investigator, and many of the characters that fill his books were inspired by his work. Now retired, he writes in his weather-tight office overlooking Old Sitka Rocks. The former Writer Laureate of Alaska, he is the author of ten novels. "A darkly poetic thriller with a strange sense of place, and exotic debut which augurs well for the author." 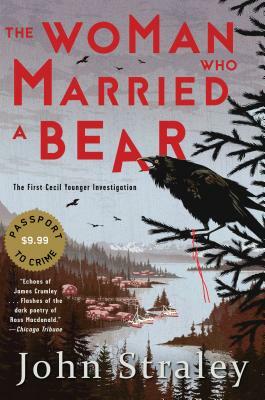 "The Woman Who Married a Bear weaves Alaska's two wildest sides together—the dark secret world of city nights, with its streets and bars, and the sprawling world of the bush country and mountain forests where bears and ravens preside. [Straley] lets you breathe the chill wetness of the country and he gives you the people of these outpost communities exactly as they are." "Strong and sobering . . . with his storyteller's sense of dramatic action [Straley's] in his glory." "Straley hits all the right notes."